Today’s Stacey Page Online newsite includes a story about two new sets of wheels in the Grace College athletic department. A portion of the story appears below. Click here to read the complete article. 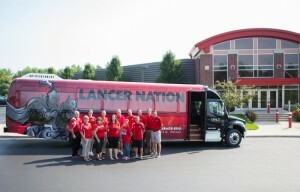 Grace College has acquired two new buses for its athletic teams to travel in. One of the buses is shown above. WINONA LAKE – The Grace College athletic teams will be riding in style starting this fall with the unveiling of two new buses. The identical buses, which seat 42 passengers apiece, feature a plush interior with six screens for watching game tape or movies. Additionally the buses are prepared with a built-in navigation system and numerous luggage locations to make traveling more efficient and comfortable. The buses are each covered in a Lancer-themed wrap, centering on the phrase “Lancer Nation” with “building champions of character” above it.